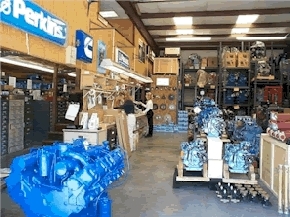 WELCOME TO TRANS ATLANTIC DIESELS, INC.
We are your one stop source for Perkins marine diesel engines, genuine Perkins parts, marine transmissions, generators and much more. Check out the Used, New & Surplus section of our web site. 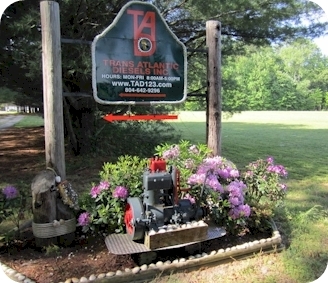 Hundreds of bargains on Used, New Take Off, New, & Refurbished engines and parts. Marine & industrial Engines, marine & industrial generators, Velvet Drive, ZF Hurth, Paragon, Walter V-Drive and other transmissions. Click here for the full list of Used, New & Surplus Items for sale on our web site. 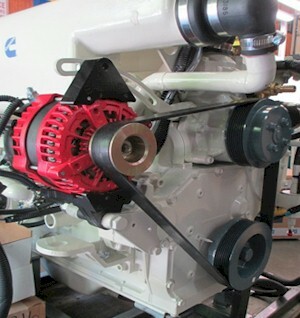 Cummins 4B 3.3-M Diesel Engine. Exclusively Marinized by Trans Atlantic Diesels -This rugged engine package is designed with the serious boater in mind. The max 65 hp is achieved at just 2600 RPM. At an amazingly low 1800 RPM this engine delivers almost 55 HP. Lower engine speed equals lower fuel consumption, lower noise level, lower operating cost and longer life! We are currently Sold Out of this engine. If you would like to be contacted when and if we have a supply please email us with your name and phone number. View the Cummins 4B3.3M Diesel. Need More Juice For Your Cummins 4B3.3M? We can offer the complete package. Upgrade your Cummins 4B3.3M charging system with the latest Balmar AT200 (200 amp) alternator or the high output Balmar 621 series (70 amp 100 amp 120 amp and 150 amp) alternator. Both equipped with MC 614 smart regulators and the new serpentine 8 groove belt pulleys. For further savings on used engine parts, visit the Used Parts Graveyard section of our web site. Here you will find a list of engines ranging from Bedford to Yanmar that are being disassembled for parts. Great Savings - Drivesaver 404 - Reg. $430.75, Now $215.00 each - 5 Available. Great Savings - Cummins Electronic Control Modules - Reg. $882.00, Now $400.00 each. 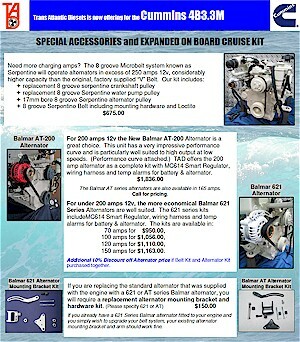 Great Savings - Perkins T6.354M Marine Exhaust Manifold Replacements. Perkins 4.236M Replacement Exhaust Manifold, part number ZZ90033SS, is now available in STAINLESS STEEL. The factory original which is no longer available was constructed of cast iron. Our replacement is made of high quality stainless steel which offers far more resilience to corrosion. It is supplied as a replacement kit, which includes all necessary mounting gaskets, hose connectors and mounting hardware. 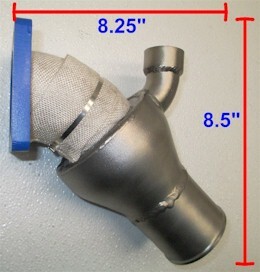 Select one of our stainless steel elbows to suit your installation or contact us for a custom build elbow.